While microwave ovens with varying dimensions and cooking features have become commonplace household items, they have a great history. Notably, this time-saver, energy efficient device was an accidental invention. An American self-taught physicist Dr. Percy Lebaron Spencer working for Raytheon Company while conducting experiments on radio waves in 1940s using a magnetron surprisingly found that a chocolate bar in his pocket started melting when the magnetron was energized. With increasing curiosity, he later conducted similar experiments like heating popcorn kernels and boiling eggs using the heat of the magnetron, the result of which made him realize the need of microwaves in the kitchen. In 1945, he filed the first patent application titled “Method of treating foodstuffs” and in 1947 a second patent application titled “Prepared food article and method of preparing” both in the USPTO. Interestingly, while both were based on microwave oven, his second patent application got granted first on August 30, 1949, whereas the first patent application got the grant later on January 24, 1950. Both the patents were assigned to Raytheon Mfg Co., a leading US manufacturer of missiles/ weapons which started selling the microwave ovens under the trade name Radarange. 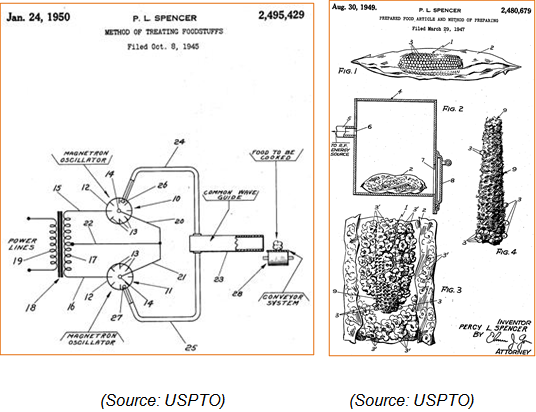 Spencer held more than 300 patents during his illustrious career. The mechanism of microwave cooking is quite amusing. A microwave oven works by heating the food at molecular level. 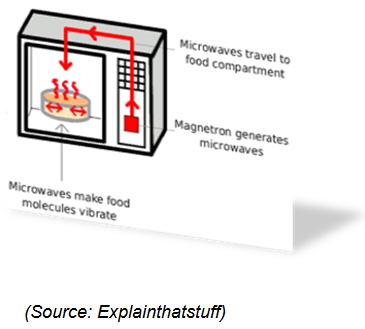 When the food is kept in the food cavity/ chamber of the oven, an energized magnetron beside the food cavity will start emitting microwaves which are carried through a waveguide to make the waves reach the food. Then, the molecules of food material start vibrating which in turn cause generation of heat within the food material to cook the food. Microwave oven when compared to conventional heating/cooking methods cooks the food in substantially lesser time. The graphs shown below depict the relationship between temperature & cooking time and temperature & food volume for both microwave and conventional heating methods. 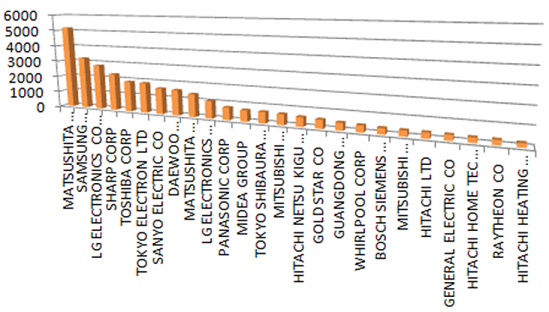 Our patent search shows that Matsushita Electrics, Samsung, LG and Sharp Corp. are leading players in microwave devices. Surprisingly, the company which has invented microwave oven stands at 24th position. According to a research study the global microwave oven market will see a growth rate of 10 – 15% by 2020.